NASHVILLE, TN – (June 10, 2014) – On Tuesday (6/3), Country Weekly magazine kicked off the 2014 CMA Music Festival with the annual Country Weekly Kick-Off Party powered by NASH, which raised $17,000 for Musicians On Call (MOC). 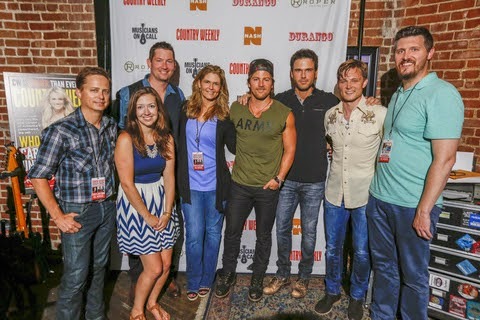 Sponsored by Durango and Roper, the party was held at the Mercy Lounge in downtown Nashville, and featured music from today’s hottest country stars - Kip Moore, Frankie Ballard, and host, Chuck Wicks. All proceeds directly impact Musicians On Call’s ongoing efforts to bring the healing power of music to the bedsides of patients in healthcare facilities. "What a great night for Musicians On Call and music fans thanks to Country Weekly, " shares Pete Griffin, president of Musicians On Call. "With incredible support from Kip Moore, Frankie Ballard and Chuck Wicks we were able to raise funds and awareness so we may continue our mission of bringing live and recorded music to the bedsides of patients in hospitals around Nashville and throughout the country." The eighth annual “Summer of Music” auction for Musicians On Call is open for bidding. Running through July, the auction features concert ticket packages, meet-and-greet experiences and personalized memorabilia from country music’s biggest stars, including Carrie Underwood, Brad Paisley, Florida Georgia Line, Hunter Hayes, Jason Aldean, Luke Bryan, Rascal Flatts, Zac Brown Band and many more. For more information on the “Summer of Music” auction and other ways to support MOC, please visit www.musiciansoncall.org.